A view within the Glasshouse. Dream Big. That’s the theme of the promotional campaign for Seattle’s new attraction, Chihuly Garden and Glass, and it’s an apt one. This eye-popping collection of work by the glass master has quickly become a visitor favorite. Eight interior galleries trace his evolving art from the early soft cylinder forms modeled on the Native American baskets he collects to the later series of Mille Fiore and more. Then comes the spectacular Glasshouse and gardens. Whether you are admiring the bright yellow, orange, red and amber 100-foot suspended installation in the Glasshouse silhouetted against a lovely blue afternoon sky, or drinking in the illuminated artworks in the gardens at twilight, you are immersed in an explosion of color, form and masterful technique. 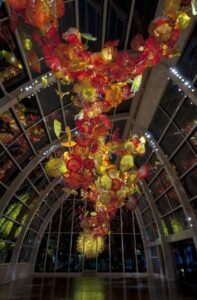 Most people would agree that Dale Chihuly is the Seattle area’s most famous living visual artist. As an artist, innovator, and co-founder of Pilchuck Glass School in 1971, he is largely credited with leading the development of glass as a contemporary art form, and establishing Seattle as the US epicenter for the studio glass movement. From the creation of Pilchuck, to the opening of the Museum of Glass in Tacoma in 2002 and the launch of the first hot-glass degree program in the Pacific Northwest by the University of Washington in 2009, the region is recognized worldwide as a center of glass and he as an early and highly influential leader. Due to his local roots, we’ve been lucky to have dramatic Chihuly artwork gracing many public spaces in the region for some time. The chandeliers at Benaroya Hall. The Seaforms at the Seattle Aquarium. The Bridge of Glass, Crystal Towers and Venetian Wall at the Museum of Glass in Tacoma, coupled with the excellent collection on view at Tacoma Art Museum. In fact, here’s a whole page devoted to the many places to see his work. But until the Garden and Glass opened last May, there was no single public venue in Seattle in which to see the depth and breadth of the work he’s produced throughout his career. And now, there is. Smack dab in the heart of Seattle Center, at the base of another Seattle icon, the Seattle Space Needle. What are you waiting for? Come be inspired. If you go: Consider the Day/Night admission ticket, which allows you to return within a 24 hour period to experience the exhibition in both day and nighttime. Or choose combo admission with the Space Needle, as they are literally steps away from each other. Hungry? The Collections Cafe offers lunch and dinner in a setting that will delight. Each table, as well as much of the wall space (and don’t forget to look up), holds some of Dale Chihuly’s prized personal collections, from carnival chalkware, vintage accordions, 1950s radios, inkwells, and shaving brushes to tin toys. A full wall of 36 of drawings completes the artistic backdrop for a tasty meal. A hot tip for a one of a kind New Year’s Eve: Have you already gazed through the Glasshouse sculpture to see the Space Needle towering above? Imagine it at midnight on December 31 when the Space Needle lights up Seattle with the West Coast’s largest fireworks display! 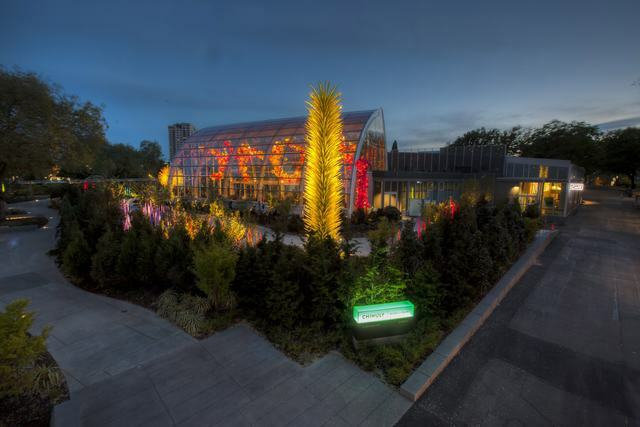 Tickets are now available for the first New Year’s Eve Party at Chihuly Garden and Glass. 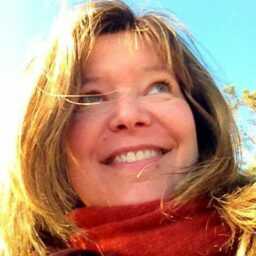 You’re invited for an evening of art, music, festive appetizers and desserts from Collections Café and, of course, libations!